A key rehearsal space for The Royal Ballet, a performance space for visiting companies and home of the Royal Opera House’s Insights programme. The Clore Studio Upstairs is home to the Royal Opera House’s Insights programme, organized by the Learning and Participation department. These offer audience members a unique opportunity to meet the creative team and artists behind productions on the main stage or in the Linbury Studio Theatre. The Clore Studio Upstairs is also a key rehearsal space for The Royal Ballet, used both for production rehearsals and for morning class. It often hosts performances and events by visiting companies. 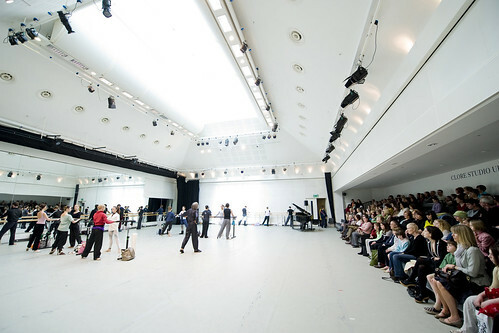 The Clore Studio Upstairs was created in the 1997–9 redevelopment of the Royal Opera House, part of a larger scheme to provide extensive, modern rehearsal spaces for The Royal Ballet and The Royal Opera, all in one building. The floor space closely matches that of the performing area of the main stage. The Clore has a sprung floor (with rubber pads and felt padding beneath the surface) to give support for dancers. As a performance space, it has a maximum seating capacity of 170. Join members of our technical stage crew as they discuss the work that goes on behind the scenes to bring each production to life. Royal Ballet Principals Akane Takada and Ryoichi Hirano discuss their lives and careers in this special event for Japanese speakers. A special event in partnership with UNHCR about the role of the arts in raising awareness of global crisis. Join Welsh bass-baritone Bryn Terfel as he prepares to return to the Covent Garden stage to perform in two productions this Summer.